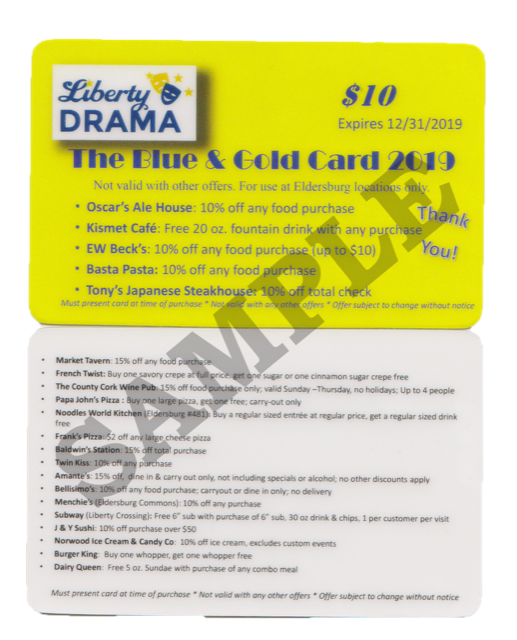 ​Liberty Drama is preparing for our annual Blue & Gold Discount Restaurant Card Sale and we need your help! As one of our largest fundraisers, we need volunteers to contact local restaurants and have them sign up to participate in the 2017 Blue & Gold Restaurant Discount card. Many hands make light work and this is an easy way for each family to help raise funds. If you signed up to solicit a restaurant to participate please use the form below. Any questions please contact us.